Looking for a new pair of hiking shoes that won’t weigh you down? Choosing the best light hiking shoe can be a bit of a challenge since there are less options and the stakes are higher because of their lack of ankle support and breezy thin fabrics. But lucky for you, we are going to tell you exactly what you need to look for, along with some of our top picks so that you can hit the trails and not have to worry. Read on to discover the 6 best lightweight hiking shoes for men right now, and what features are non negotiable! Lightweight hiking shoes with optimized support, low ankle shaft and an extra serving of ventilation for maximum breathability are the ones you want to look out for. They are meant to keep you light on your feet for climbing, hiking and walking in temperate, dry weather. Most boots will achieve this breeziness through ventilation flaps and mesh material, versus full grain leather construction that works well for arduous backpacking trips but truly ends up being overkill for smaller, less demanding jaunts and adventures. Most seasoned trekkers will tell you that 5 pound boots will feel like 50 pounds on the trail, but most of the time that extra poundage serves a good purpose. Heavier boots are more durable, offer more structural support, are equipped with tougher shafts and more grippy lugs that'll keep you intact on challenging trails. But if you are hiking in warm, agreeable conditions you should definitely try to get away with lighter hiking shoes because all those heavy duty features will be overkill for chill adventures and pleasant hikes. 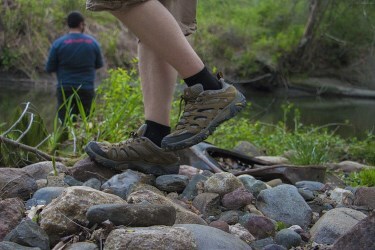 Most hiking shoes are outfitted with a water resistant membrane. But in the case of most light hiking kicks they are more in the spectrum of being resistant to water, rather than completely waterproof and sealed, simply because total waterproof shoes are made with heavier materials like full grain leather. For the most part, while you are selecting hiking shoes you are going to want shoes that are good at keeping your feet cool, rather than dry. So opt for plenty of moisture wicking material and mesh that will let all that sweat escape your feet and footbed. Additionally, if you expect the trails to be muddy or slick after some summer storms choose a pair of hiking shoes that have sizable grippy lugs with rubber that curves over the outer edges of your shoe, which will prevent the mud from touching the mesh areas of your footwear. Finally, your shoe's weather rating, weight, and breathability could be perfect for you and your adventure. But at the end of the day, the fit and feel of your boot is the true dealbreaker. When you first crack open that hiking boot box you are going to want to lace up in the socks that you will be donning on the trail, preferably cushy moisture wicking wool socks that'll keep your feet way less sweaty. Another reason to try on the boots with the appropriate socks is since all that sock padding can bump you up a whole half a foot size. So do yourself a favor and start off on the right sock. Also, if you have orthotics or special insoles that alleviate arch pain or such, try your boots with these too. When you first lace up pay attention to how they fit and how roomy they feel. First you should slide your toes forward to the front of the shoe and insert your index finger between your heel and the back. There should be about 1/2 to 5/8 of an inch that'll serve as just enough wiggle space for when you descend mountains. Also, if you are stuck between sizes, opt for the larger shoe since everyone's feet swell throughout the day and especially during a hike. After you have checked for these details go ahead and move around. Step up onto a bench, jog in place, take a lap around the store (or your living room) and make sure that nothing is pinching you. If you feel some minor discomfort due to the boots stiffness, that feeling should recede and fully disappear as you break the shoes in. But in the case of lightweight hiking shoes you shouldn't feel any pain at the get go, they should be comfortable right away, unlike heavier-duty boots that need to be broken in. Every adventure footwear company uses a different foot model so don't be discouraged if the first boots you fall in love with don't reciprocate. Just keep on trying different models and you will find the perfect fit. Even though lighter hiking shoes don't require a rigorous break in process it is still vital to carefully form the shoes to your feet so you can avoid those crunched toes, raw blisters and sore arches. If you haven't had much experience breaking in shoes, this video will help. This video is for heavy duty boots but the tips, tricks and process works just the same for lighter footwear, although you won't have to be nearly as rigorous. If you don't have time to watch, or your data connection is limited, I'll sum up the basics. First you will want to wear your new hiking shoes around the house, climb your stairs, chase your dog around the living room and so on. Then you'll want to wear them out on some short walks to the park and grocery store. Finally, if all that doesn't kill your feet then go on a curt hike (just a mile or two). Then at that point your shoes should be worn in enough for a long backpacking adventure. The more weight you carry, the more you'll have to thoroughly wear down the shoes, as that extra weight puts extra strain on those adventurous feet. 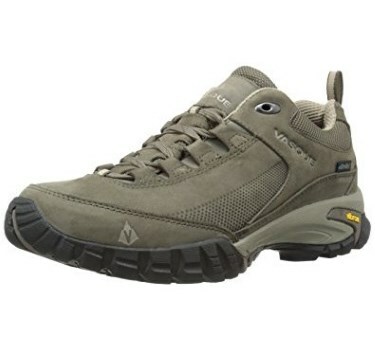 The Vasque Men's Talus Trek Low Ultradry is a low hiker which provides all the same performance with less weight and more mobility than its bulky competition. It has an integrated UltraDry waterproof system with a wicking mesh liner that’ll keep your feet dry from the drizzle but also from your own sweat. The speed lacing feature makes it easy to throw these boots and kick them off at the end of a long adventure. Additionally, they have an athletic EVA midsole which absorbs shock and supports your feet every step of the way. The 1.8mm waterproof nubuck leather is joined with an abrasion resistant polyamide mesh for a tough exterior that also breathes well, even on sweltering days. Lastly, the Vibram Nuasi sole uses XSTrek rubber compound and angular, multi-directional lugs for the kind of traction that’ll stand you upright on a water slide. 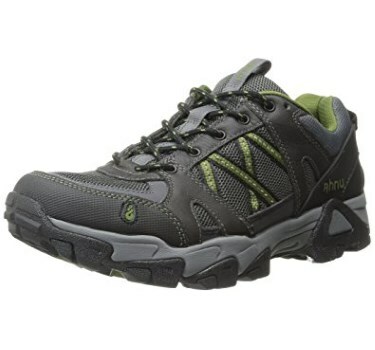 The Ahnu Men's Moraga Mesh is a great light hiking shoe with a stellar stability platform. Its mesh upper will keep your feet dry, cool and happy on all shorter treks. The exclusive neutral positioning technology, Numentum, promotes proper foot balance by helping your foot stay aligned and centered providing you with some major stability even if you are walking across wobbly rocks and slippery terrain. 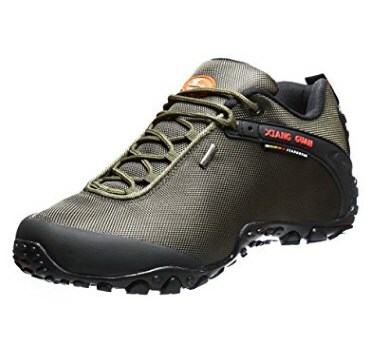 This hiking shoe also has a durable leather and mesh upper designed keep the elements at bay without making you feel like you are hiking in a rain boot. A thick grippy rubber sole provides excellent traction while a soft insole cushions each step you take on a trek. Additionally, it has dual pull-tabs to make it way easier to slip your foot in, and a lightweight, compression-molded dual-density EVA midsoles provide shock absorption and cushioning. Also the insoles are removable so you can swap out the insole for some orthopedics that alleviate your high arches or hotspots. Lastly, its thermoplastic urethane shanks, medial and lateral midsole posts and forefoot shock dispersal plates supply support and flexibility without ever feeling cumbersome. The Oboz Men's Sawtooth Hiking Shoe is a stellar cross training shoe for everything from trail running to extended backpacking trips. These shoes feature nubuck leather uppers that are composed with abrasion-resistant nylon mesh panels for just the right combination of protection and breathability. The nylon mesh linings wick moisture, so no matter the weather your feet will dry out quickly. The anatomic EVA footbed and dual-density EVA midsoles provide cushioning over long trail runs or arduous climbs up rocky crags. Additionally, the nylon shanks offer torsional stability and protection underfoot, increasing sure-footedness on challenging terrain and reducing stumbles and tumbles. Lastly, aggressively lugged outsoles utilize a durable, sticky rubber for exceptional grip in all directions on both sleek and rough surfaces alike. The XIANG GUAN Men's Low-Top Outdoor Shoes are made of oxford fabric which is a breathable, and inner material made of the comfortable Lycra perfect for keeping your feet cool, dry and comfortable. 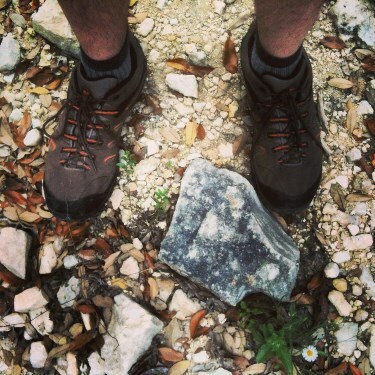 The hiking shoe’s top is 2mm thick and coated with a hard protective film, which can prevent stubbed toes or even block the bite of a critter (like a snake, rabbit, squirrel, etc). The laces are made with super strong solid round nylon rope that doesn’t bend or break with heavy usage. Additionally, the premium rubber outsoles offer high resistance against skid and wear while the removable EVA insole allows for easy and simple adjusting so you can tinker with the position and fit, and wash the sweat out of the insole. 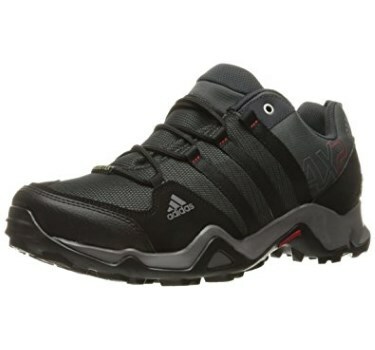 The Adidas Men's Ax2 Gore-Tex is a versatile hiking shoe that is perfect for fast paced adventures that require light footing. 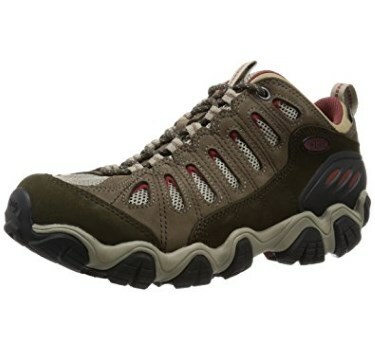 It is equipped with durable mesh and synthetic upper materials that repel annoying trail debris. The GORE-TEX technology ensures breathable, waterproof protection from outside elements and a molded foam insole, and lightweight EVA midsole provides long-lasting plush. This pair offers superior underfoot cushioning so your feet feel refreshed. Lastly the heel pull tab for you to put on and take off the boots while the high-traction TRAXION rubber outsole delivers some noteworthy grip. 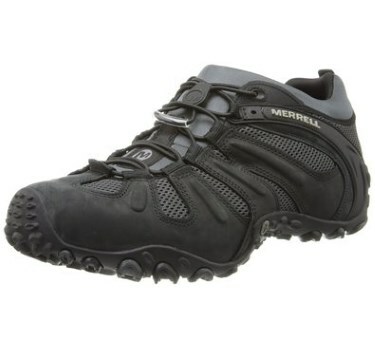 The Merrell Men's Chameleon Prime Stretch Hiking Shoe is jam packed with smart features and is engineered to help you be light on your feet while you run up mountain paths. The bellowed tongues and uppers made with a combo of leather, mesh and synthetic materials will keep any kind of debris from worming its way into your shoe. The breathable mesh lining with M Select Fresh naturally prevents odors before they can start, so even though the shoes get soaked in sweat, they won’t smell like it. The removable EVA footbed and Merrell air cushion in the heel absorbs shock and keeps your feet feeling good while a molded nylon arch shank adds all the stability you could want while you go scampering up boulders and hoping across creeks. Lastly, the M Select Grip tunes each outsole with durable traction and a 4mm sole lug depth will help your boot dig into the ground and avoid those dreaded surprise tumbles. This techy stunner won by a long shot because it really gives you the best of both worlds with this high-performance hiking shoe. The first reason why it is a cut above the rest is because of its unique breathable mesh lining with odor-killing M Select FRESH treatment that'll not only keep your feet comfy but will keep your shoes smelling like shoes instead of 25 adventures worth of sweat. The M Select GRIP outsole creates traction on any kind of surface at any angle meaning you can hop, skip and scamper without worrying that you'll faceplant. Additionally, the awesome bungee and toggle lace system ensure a secure fit that you don't have to tinker with, like you have to with other hiking shoes. There you have it. We would 10/10 recommend Merrell's light hiking shoe but at the same time, all of these stellar boots will take your adventure from good to great.